OVERLAND PARK, Kansas Hoppe’s, the best known name in gun care products, announced that an item in the Gun Medic line has received the prestigious “Member Tested and Recommended” seal of approval from the members of the National Tactical Officers Association (NTOA). After extensive testing by law enforcement officials – judged on a scale from 1 to 5 –the Gun Medic Cleaner and Lube - Quick Fix received a score of 4.22. The unrivaled Gun Medic “All-in-One” formula cleans the actions of firearms and leaves behind a thin layer of high performance lubrication, protecting against the most punishing corrosion. 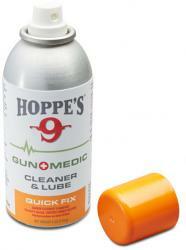 With a cleaner that evaporates in 60 seconds, Hoppe’s Gun Medic Cleaner and Lube is great for a quick clean when you don’t have time for a deep clean.